The Adventures of Sherlock Holmes - with - The Memoirs of Sherlock Holmes - Sir Arthur Conan Doyle 1892 - George Newnes Ltd., London - First Edition, First Issues (preceded by the Strand Magazine publication) A smart bright pair, first editions in their earliest issues of the classic Sherlock Holmes short stories, up to the Reichenbach Falls episode of The Final Problem. Illustrated throughout from wood engravings by Sidney Paget. 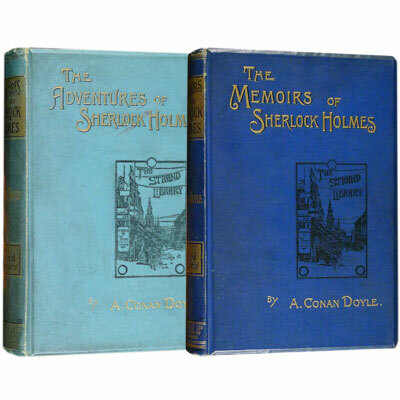 Adventures contains twelve stories including A Scandal in Bohemia and The Speckled Band, Memoirs contains eleven stories including The Final Problem, and “Silver Blaze”. Suitably housed in a custom clamshell case of half dark blue morocco leather over matching cloth, lined with felt, titles in gilt. ‘The Adventures of Sherlock Holmes’ with the first issue point of the name ‘Miss Violent’ [line 23 page 317], which was later corrected to ‘Miss Violet’, and and the front pictorial board without the street name. The Memoirs of Sherlock Holmes with the peacock endpapers. References: DeWaal, The World Bibliography of Sherlock Holmes and Dr. Watson. Green & Gibson, Bibliography of A Conan Doyle, A10a, A14a. BMC No.271, The Great Illustrators. Greene & Glover, Victorian Detective Fiction 128, 129. Haycraft, Murder For Pleasure 45. Cooper & Pike Detective Fiction 115. Eric Quayle Detective Fiction. Hardwicke Complete Guide to Sherlock Holmes. Keating; Sherlock Holmes and his World. Ellery Queen, Queen’s Quorum, 16.